Neil Warnock was left seething that an “assault” from Craig Dawson on Julian Speroni was missed in the build up to West Brom’s first goal on Saturday. 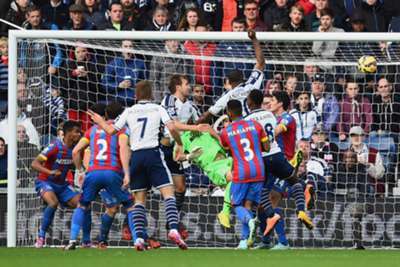 Crystal Palace manager Warnock witnessed his side blow a two-goal half-time lead at The Hawthorns, as West Brom fought back to clinch a 2-2 draw in the Premier League. Victor Anichebe made the difference off the substitutes bench, scoring West Brom’s first before winning a penalty for Saido Berahino to equalise in injury time. However, Warnock was furious that West Brom’s first was allowed to stand as centre-back Dawson appeared to catch Palace goalkeeper Speroni with an elbow – which ultimately forced the Argentinian off. “Unfortunately the referee’s not got technology, but it’s almost an assault on him [Speroni],” he said. Palace went into half-time 2-0 ahead thanks to Brede Hangeland’s close-range effort and a penalty from captain Mile Jedinak. But Warnock believes his team should have had the chance for a second before going 2-0 in front, when Wilfried Zaha was tripped by Dawson in the penalty area with the score still at 1-0. “He [Clattenburg] had a good game and I wish we had him every week,” he added. “But there were two or three decisions that went against us and that cost us. It was a certain penalty in the first half [for Zaha].